The Sexten Dolomites with its famous "Three Peaks" are known as a wonderful biking area. Choosing a conventional transalp route, it will be hard to reach them. Therefor we developed a tour, having the Three Peaks as its most important destination. In this way we offer extraordinary views over the mountains of the Dolomites. Starting from the main alpine ridge, you will have the possibility to enjoy intensely experiences by bike in the middle ot the mountains, designated as a unique natural world heritage. As we are using the cable car twice, we will be at an elevation of 2000 meter several times. Nevertheless, downhills won't be too difficult. You’ll receive all travel documents about 14 days before departure. They contain the exact hotel address and further information. Please arrive by 6:00 p.m.. You’ll meet your group and the guide. After discussing the tour, the group will go to dinner together. This first day will be characterized by a diverse range of different paths. Large segments will be managed via the Brenner-cycling path. Soon the main Alpine ridge will be conquered. Afterwards we will reach the lonely Pflerschtal. 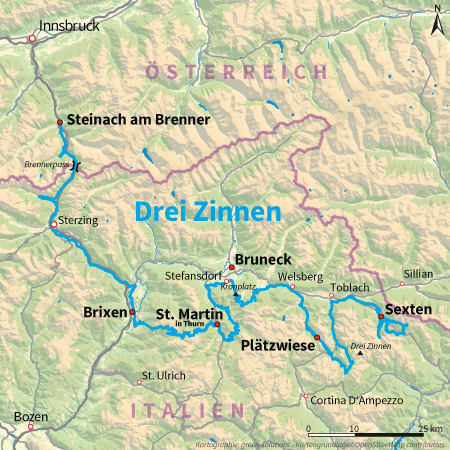 After a grand finale through the Isarco valley we will reach the diocesan town of Brixen. We’ll stay overnight in a 4-star hotel located in the historic old town of Brixen. The cable car takes us right up to the top of the Plose. Our well deserved break offers fantastic views of the Geisler peaks. We will get really close to the mountain range. The descent to St. Martins seems not to end. Our destination is a good hotel with best cuisine. The ascents in the Dolomites can be really steep. But we will be compensated by great views. After lunch we will reach our 4-star hotel with great buffet dinner via a unique panorama paths. The cable car takes us up to the top of the well known panoramic mountain: The Kronplatz with its 360 degree panoramic view and the new Messner Mountain Museum is a magical place. The rest of the day will be characterized by great Dolomite landscape and dynamite trails. We will sleep in a traditional mountain hut at 2000 meters altitude. The atmosphere up here is unique. We climb up to the monte Specie with an altitude of 2300 meters. There we enjoy the morning light in front of the “Three Peaks”. The panorama is overwhelming. During the descent we will see more important mountains of the Dolomites. Monte Cristallo is one of them. Via Toblach we reach our destination Sexten. Our hotel is a 4-star Spa hotel. During this wonderful day excursion we will see the Sextner Dolomites in all its beauty. Great views compensate for the efforts of the tour. We will celebrate with a farewell dinner. After breakfast, the bikes are loaded onto the bus. Return trip by bus back to Steinach. Upon arrival, everyone travels home individually. Andreas Hübl, ALPS bike guide for the Transalp Dolomites Three Peaks. Arrival: Arrival by car or train to Steinach am Brenner/Austria. June: 15. /	22. ** /	29.